Dr. Marie Nolan is internationally known for her work on patient and family decision making in the face of critical illness. The research that she has undertaken with her interdisciplinary research team has revealed that even when capable of independent decision making, many critically ill patients prefer shared decision making about medical treatments with their family and physician. Dr. Nolan is professor and executive vice dean of Johns Hopkins School of Nursing. She also previously directed the PhD program there and is the Johns Hopkins director of the first nursing doctoral program in China to graduate PhD students, Peking Union Medical College and JHSON funded by the China Medical Board of New York. She is also past-president of the International Network for Doctoral Education in Nursing (INDEN). 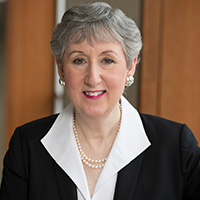 Dr. Nolan holds a joint faculty appointment in the Johns Hopkins Berman Institute of Bioethics and has served on advisory panels of the National Institutes of Health regarding end-of-life care research. Widely published in the nursing and multidisciplinary research literature, Dr. Nolan has edited two books, Measuring Patient Outcomes (2000) and Transplantation Nursing: Acute and Long-term Management (1995). Nersesian PV, Han HR, Yenokyanb G, Blumenthal RS, Nolan MT, Hladek MD, Szanton SL. (in press). Loneliness in middle age and biomarkers of systemic inflammation: Findings from Midlife in the United States, Social Science and Medicine, doi.org/10.1016/j.socscimed.2018.04.007. Davidson PM, Rushton CH, Dotzenrod J, Godack CA, Baker D, Nolan MT. (2016). Just and Realistic Expectations for Persons with Disabilities Practicing Nursing. AMA Journal of Ethics. 18(10):1034-1040.